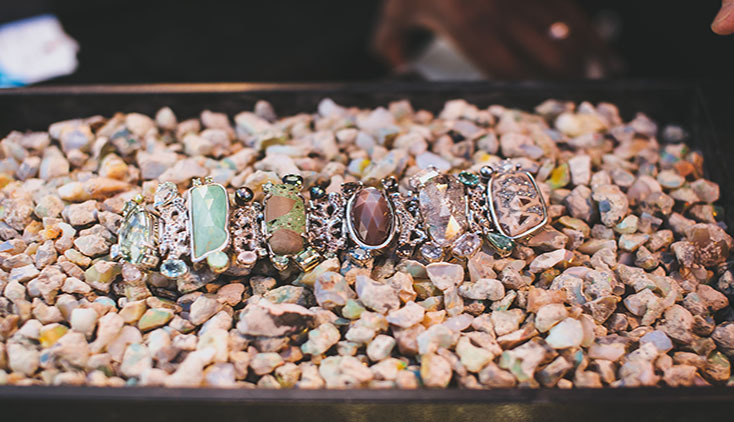 "To feel each stone through my fingers is extremely good for the soul," Stephen Dweck. 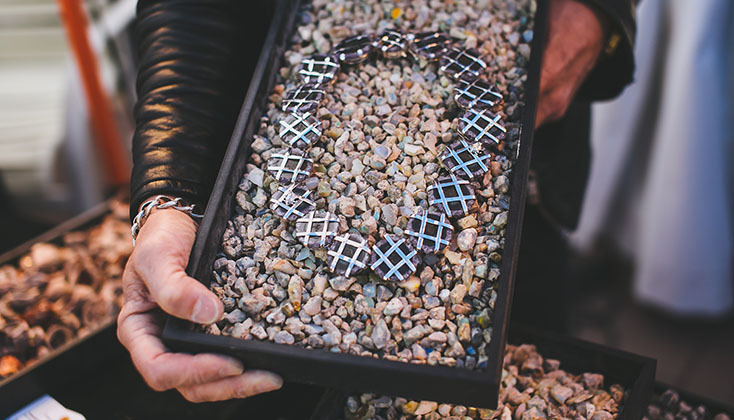 "While Tucson is known for the quantity and variety of rough stones, it is then back in the design studio where I translate its natural beauty into a wearable piece of art without losing any of its integrity," Stephen Dweck. 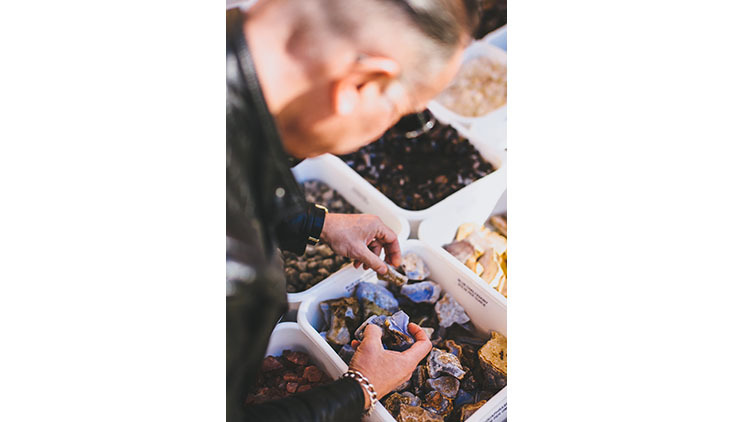 "There is nothing like feeling the stones to understand its energy, as these minerals were born and remain as treasured finds of the earth," Stephen Dweck. 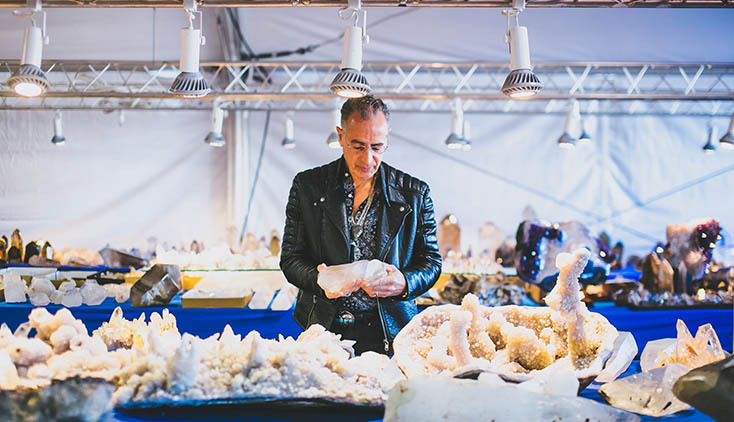 "Tucson is a great opportunity for rock fanatics to come together, I'm always looking to learn and expand on my knowledge of minerals from fellow geologists in the industry," Stephen Dweck. "Examining and studying the growing property of amber and how nature takes it form," Stephen Dweck. 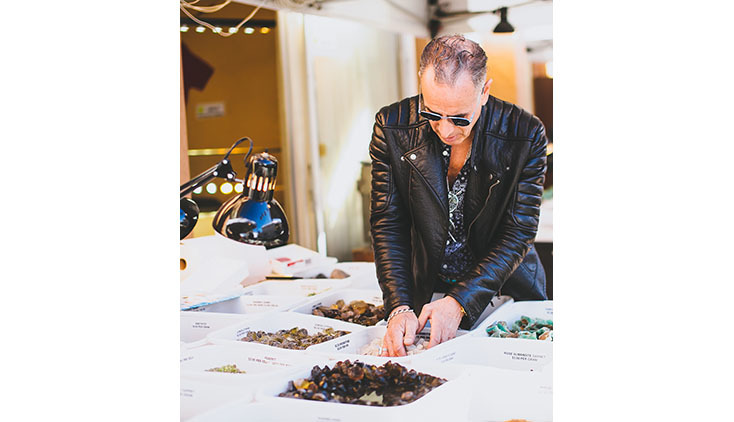 "Indian Pentagonite, a unique rough form that Mother Nature magnificently started is weaved together in the story that I elaborate on when I design my jewelry," Stephen Dweck. 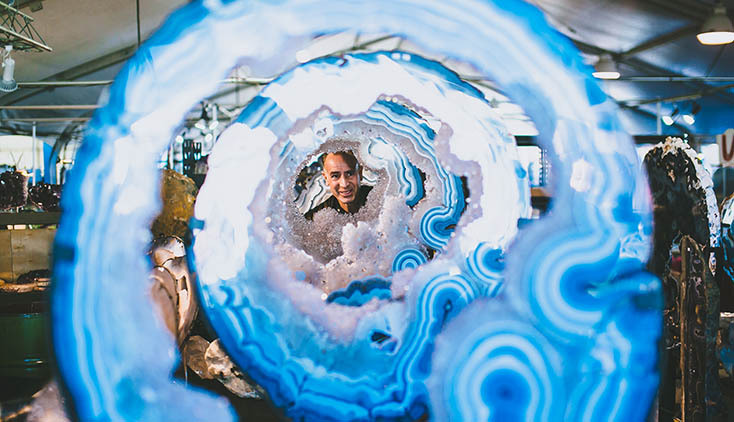 "Here I am exploring the unique rhythm from nature, this art installation with nine encircling slices of crystallized agate in quartz originated from a single geode in Brazil," Stephen Dweck. "As with the big the Big Bang Theory, Rutiles and Hematite collide in quartz," Stephen Dweck. 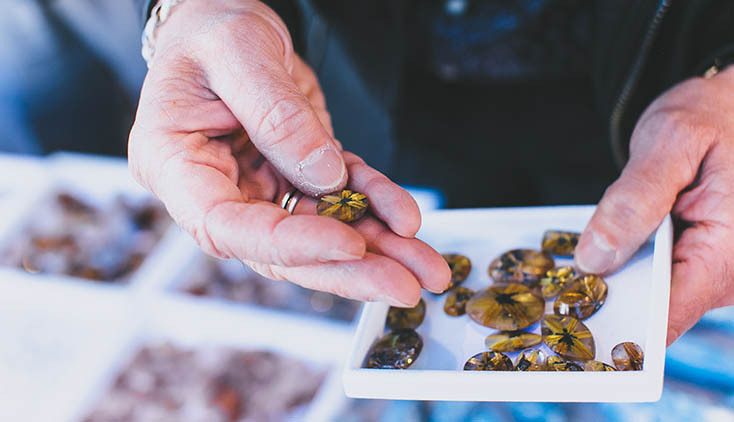 "The ultimate melting pot, the Tucson Gem Show brings together all four corners of the earth with an endless array of gems, beads, stones and minerals," Stephen Dweck. 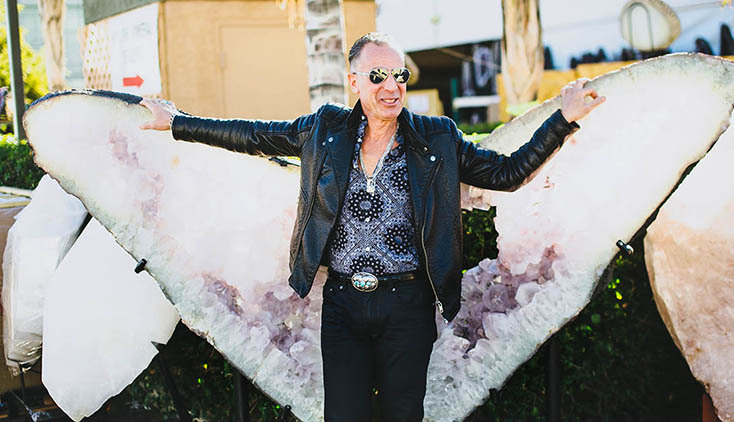 “Rough beryls, chrysoprase quartz, and Morganite, nothing better than connecting with all of my gem friends,” Stephen Dweck. 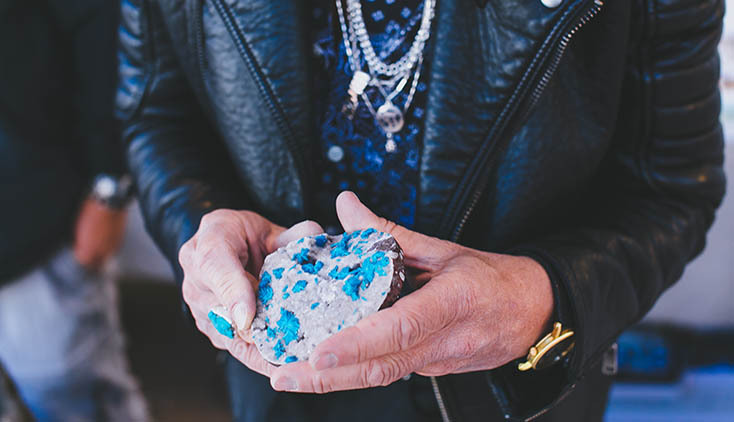 "Matching slices of aquamarine that came from a continuous rock that formed billions of years ago, set in one of my necklaces," Stephen Dweck. 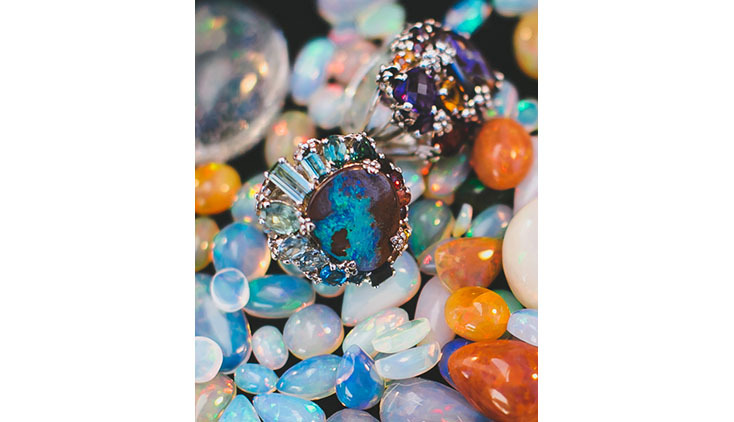 "Boulder opal is highlighted in sterling silver flower prongs in two of my rings set in an array of mesmerizing gemstones of opal, amethyst, and tourmaline from across the globe," Stephen Dweck. 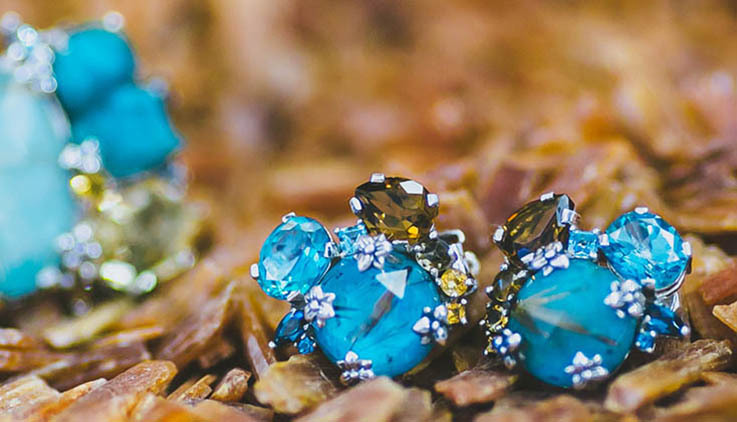 "Signature hand carved details are juxtaposed against a cluster of faceted gemstones of blue topaz, turquoise, citrine and cognac quartz," Stephen Dweck. “Acquired at Tucson as a single rod, this necklace I designed is formed from a single stalactite, sliced and caged in my signature sterling silver in the most instagram-able necklace,” Stephen Dweck. 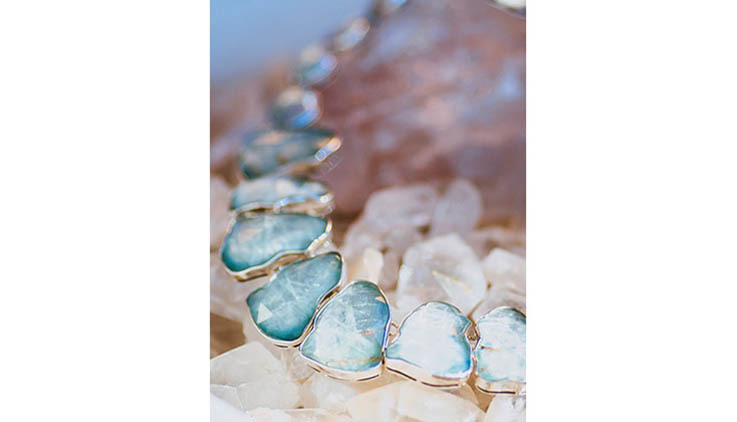 "Inspired by fantastical sea creatures, my mermaid bracelet features rare and extraordinary materials of druzy, rutilated quartz, moonstone, green turquoise, and brown topaz. 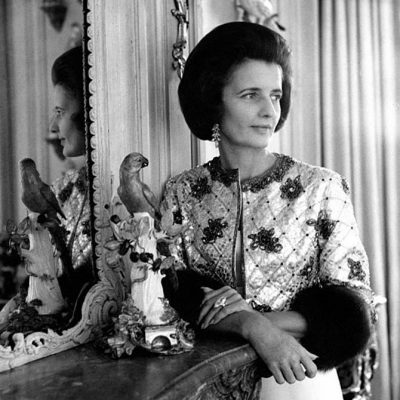 A beautiful specimen that can never be duplicated," Stephen Dweck. 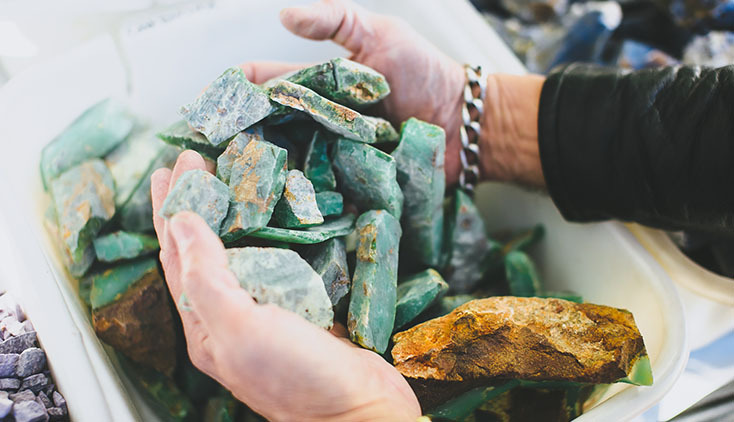 "My quest to find the most beautiful blue chalcedony never ends. 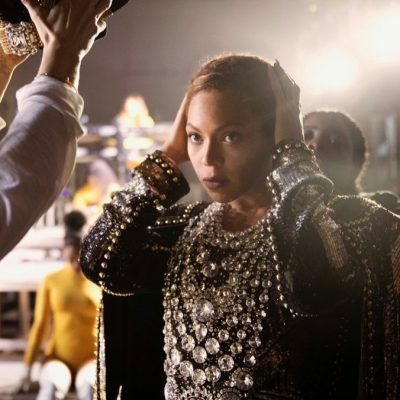 Even if it requires searching through thousands of stones, no stone gets left unturned," Stephen Dweck. 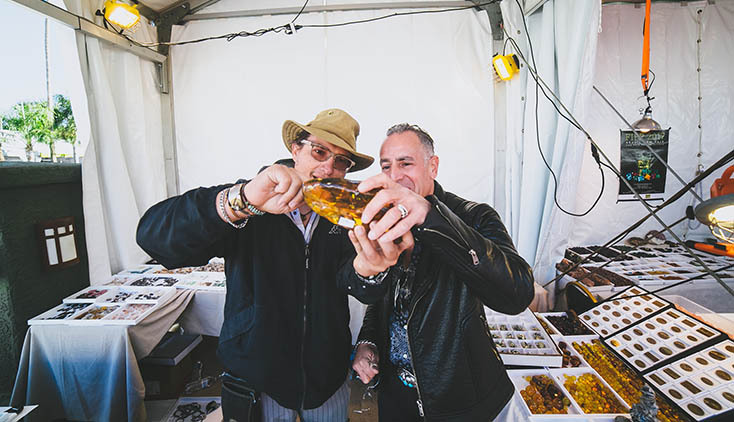 There are a handful of important gem shows around the world, but the general consensus is the presentation in Tucson, Arizona is the best, if not the most beloved. 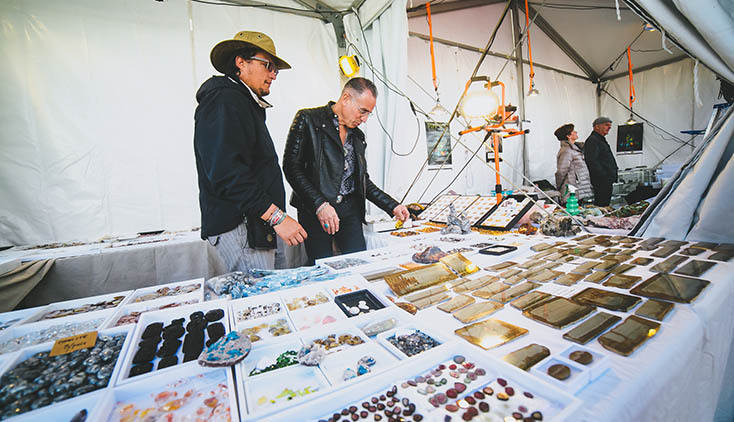 Situated in the middle of the Sonoran Desert among picturesque mountain ranges, gem dealers and designers from all over the planet descend on the small city with a population of just over half a million for the two week show that begins at the end of January. 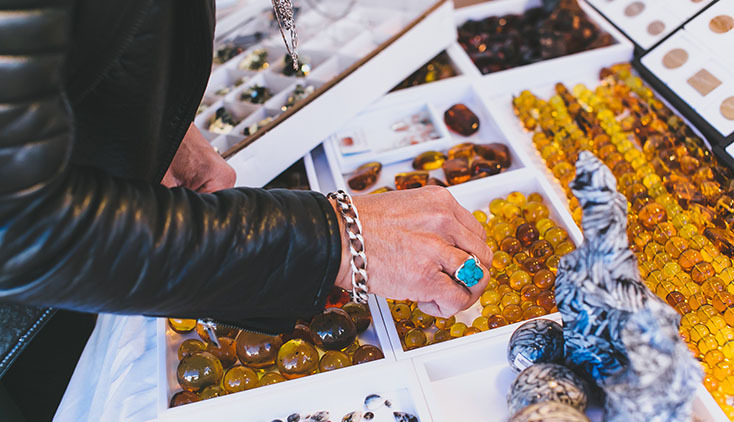 (Technically, it is made up of around 40-different shows specializing in everything from beads and fossils to antique jewelry.) 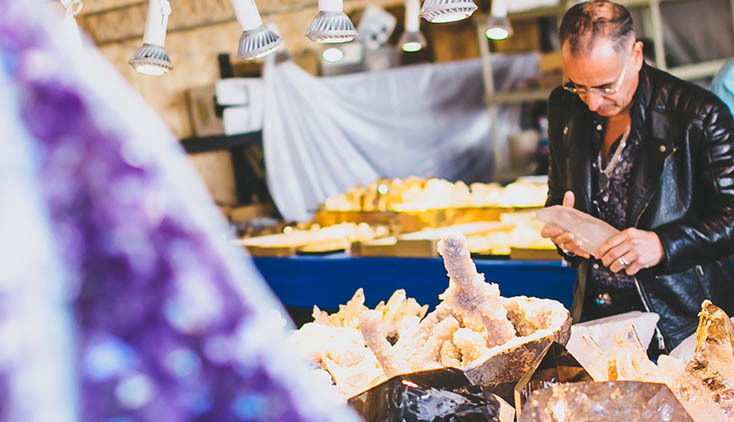 While Tucson may sound like an odd destination for folks in one of the most rarefied segments of the luxury field, it all kind of makes sense when you realize the middle-of-nowhere location is connected to Arizona’s rich natural gem deposits. 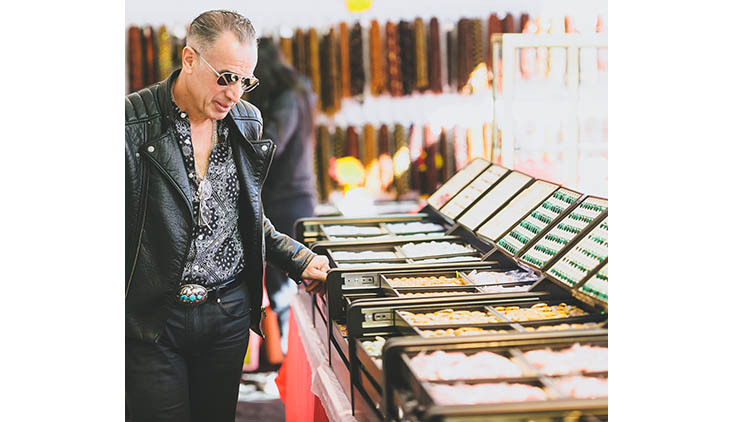 Dweck’s long shopping list includes gems that can be listed from A to Z. Stephen blends the gems together in magical jewels at his studio in Manhattan. This year some of his finished pieces were taken on the journey back to Tucson and photographed in situ for a photo diary. See them in the slide show above.